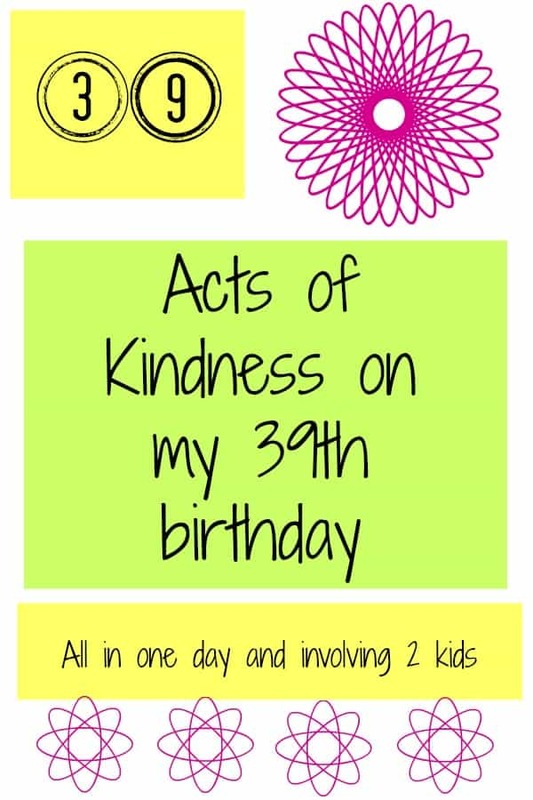 For my 39th birthday, my children and I performed 39 simple acts of kindness. It was a day that is normally set aside to be about me. So, I flipped it. I made it about other people. My kids had a blast. Because it was still my birthday, the kids were pretty amiable towards everything I asked of them. It required some planning beforehand. I had 39 simple acts of kindness to perform (with children in tow) after all. Here were my goals. I wanted all the acts to be performed in one day. Acts had to be kid friendly since my kids should be involved in all the simple acts of kindness. Each act would be unique. Some acts would be anonymous since that is what my son and I are most comfortable with. Have a list larger than your target number. Some of your ideas may not work out even if they seem easy. Especially if you bring your kids along. They can make you want to throw your hands up in the air and just forget it sometimes! It was way more exhausting than I had anticipated. It took us about 7 hours, including stopping for lunch, and we were all drop dead tired at the end. Turns out driving around town takes longer than expected and it’s almost impossible to arrange them all without doing some redundant driving. We stopped at the grocery store first and loaded up on some $10 gift cards, baked goods, and flowers. We used these for the majority our outing. If you’re doing simple acts of kindness for your birthday, consider asking for gift cards in small denominations that you can use to pass out. Here’s the final list of what we ended up doing. Pay it Backward: we bought coffee for the person behind us in the drive-thru lane. **plus I had to start my day with a Starbucks, it was my birthday after all! Complement the first three people we see. It didn’t count to compliment each other, it had to be strangers. Give a friend a gift card for pizza. Buy and deliver a friend a candy gram. Our friend wasn’t home, so we were able to visit with his elderly parents. Buy and deliver a bouquet of flowers to Great Grandma. Send money to Gofundme for a friend. Surprise a neighbor with baked cookies. Leave a gift card at a gas pump: I taped a gift card to the gas pump. Bring a friend one of my used books. Purchase extra dog food & toys and bring it to an animal shelter. Take treats to the children’s nurse’s office. Take treats to school librarian (it was school in-service day). Bring Grandma a coffee to her work. Make a point to talk to a family member who I haven’t seen in a long time. This one happened to work out in my favor, we were having lunch and I saw a family member on the other side of the restaurant. I would normally have let the opportunity go. Take treats to the school office secretary. Leave bubbles at the park in random places. Donate old towels & blankets to an animal shelter. Donate to charity when checking out a movie rental. Have a clean-up party at the park. Leave a server a big tip. 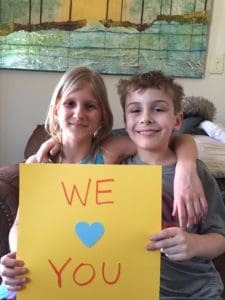 Take a picture of the kids with the “I Love You” sign and send it to loved ones. This went over very well! Leave quarters in shopping carts at Aldi’s. The kids especially love this one and still ask to do it. Leave a snack in the vending machine. We left money in the vending machine but then the kids couldn’t help placing a selection and letting the snack drop. Let someone merge in front of me in traffic. Give someone homeless a gift card. Drop off razors for a local charity. Drop off clothes at a local charity. Help someone’s cause on Gofundme that I do not know. Pay towards a loan at Kiva. If you are unaware of this charity please check it out – the money you donate gets paid back to you! Give a gift card to Starbucks for my daughter’s teacher. Give a gift card to Starbucks for my son’s teacher. Bring a pizza gift card to a friend. Take treats to mom’s neighbor. Take mom’s dogs out for exercise. Donate some of our old books to the little library. Donate a dollar to the March of Dimes when checking out at the grocery store. Pet dogs at my mom’s house. Full confession: We were at the end of the day and decided this counted for me because I never pet the dogs and they always want me to. Run an errand for my mom. There’s a whole website dedicated to Random Acts of Kindness. Make sure not miss RAK week in February each year! Brad Aronson’s blog is full of ideas for simple acts of kindness. 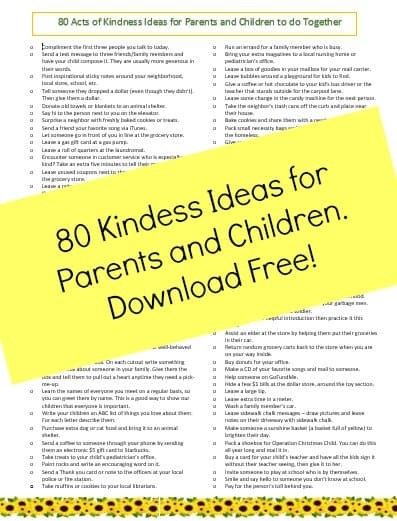 Do you want 80 Random Acts of Kindness Ideas to do with your children? Download it from my resource library for free!